I mentioned a long time ago that I occasionally fall back on deb2targz when I’m checking out little programs here and there. In my case, there are times when, for example, a program won’t build in Arch, but it’s available precompiled in the Debian repositories. For times like that, deb2targz shunts the .deb file to a tar.gz, which can be used in Arch as well as a few other distros too. deb2targz only does one thing. It doesn’t take any switches that I can see. It doesn’t have a man page that I could find. And aside from the information on the home page, that’s all the guidance you get. 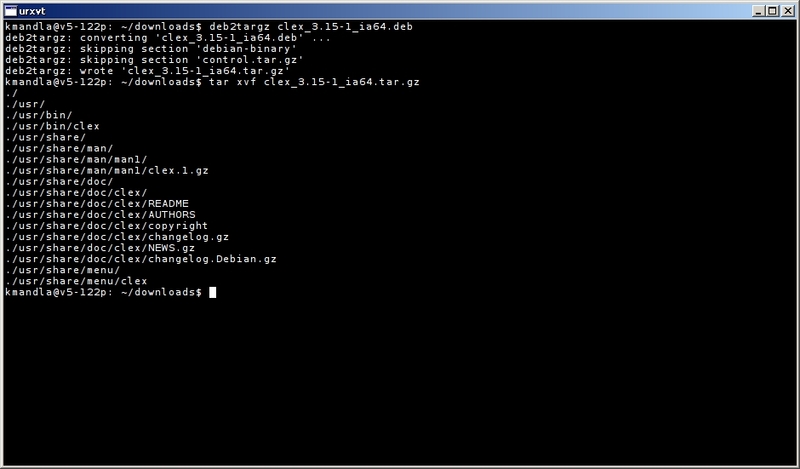 For the record, I don’t bother actually installing the tar.gz file. Decompressing it and ripping out the binary is usually as close as I get. And yes, I know about alien. What do you think is next? This entry was posted in Linux and tagged convert, distro, package on 2013/10/09 by K.Mandla.